It’s an attractive and unusual looking group of mostly doubly terminated crystals formed by a prism and a dipyramid. The main one in the center of the specimen is striking for its size and its centered position, very esthetic, on the piece. All are very bright. 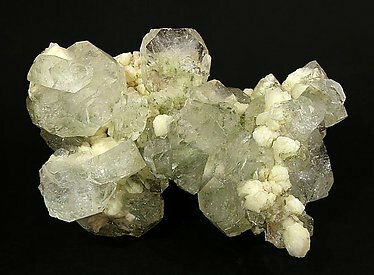 Huge, perfect, doubly terminated Fluorapophyllite-(K) adorned by Stilbite crystals. Pretty! The group is particularly esthetic because the crystals are elongated by the sharp pyramid that accompanies the prism. They are also noticeable for their transparency, brilliance and sharp clear green color. Floater prismatic crystal of equant habit. It is white with brown areas irregularly distributed throughout the crystal: This species is rare for the locality, more due to its size and the excellent crystalline development of the sample. 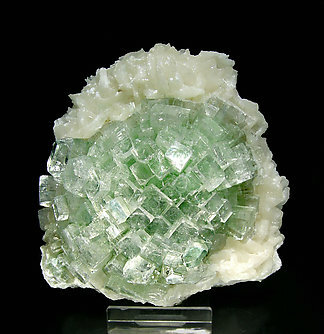 Fluorapophyllite-(K) forms attractive spheroidal groups of uniform deep green color due to the high quantity of Celadonite inclusions that it contains. The sample is very esthetic thanks to its contrast with the clearer matrix of small Calcite crystals. 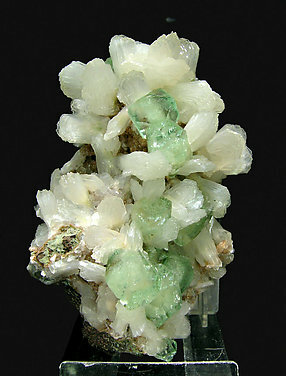 Tabular crystals are uncommon in Indian Fluorapophyllite-(K). 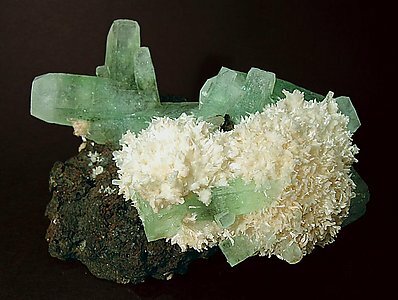 In this case they are also very well defined and aerial, with a very light green tone and a good contrast with the cream-colored Heulandite-Ca. Yes, this is an exceptional specimen! 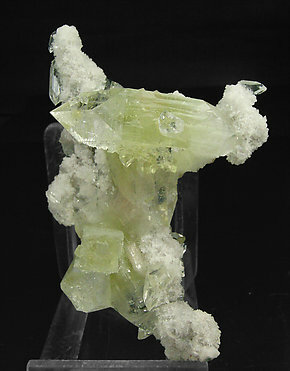 The inclusions of Julgoldite-Fe that dye the crystals of Fluorapophyllite-(K) towards the bottom of the specimen, by the contrast they create, make the transparent ones in the upper half very appealing. While the photo cannot show it, the play of color and reflections is spectacular. 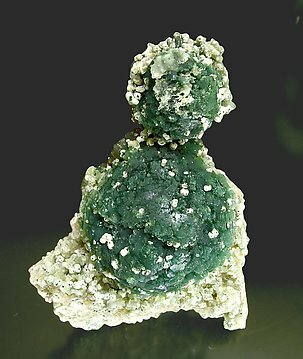 Green globular growths of Prehnite and, on them, there are clear prismatic crystals of Fluorapophyllite-(K), most of them doubly terminated. The crystals are formed by a sharp prism and a very acute dipyramid and are very transparent and bright. They also present a neat geometrical zoning of greenish yellow color on the area of the prism. 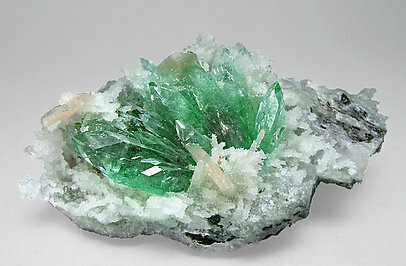 On Quartz matrix, the two main crystals are doubly terminated. An explosion of form and brilliance. For all my experience in color analysis, I cannot quite understand how such gentle colors can result in the superb contrast this specimen has. 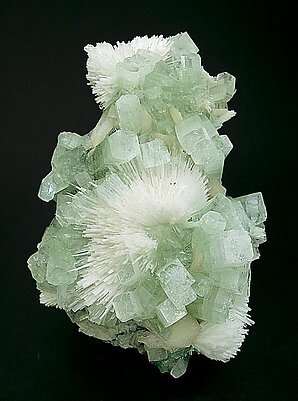 All the minerals, Fluorapophyllite-(K), Scolecite and Stilbite, seem to combine with great elegance. The excellent state of the specimen, which looks very fragile and delicate, show how well it has been cared for by those who collected it and have looked after it since. This one deserves a good description. 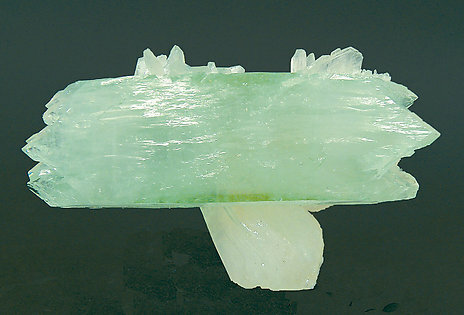 The crystals of Fluorapophyllite-(K) are very long (prismatic) and seem to fly on the matrix. They are a deep green color. Between them there is something that looks like a coral Aragonite – in reality it is Scolecite. So between these the over effect is pleasing and it would look great in a cabinet display. 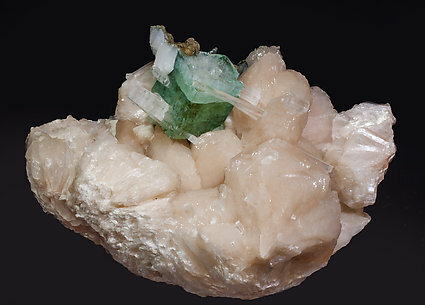 Your eyes are attracted by the softness and chromatic harmony of this combination of three minerals: white Stilbite and Scolecite with crystalline green Fluorapophyllite-(K). All of this on a base that intensifies it even more, red due to the presence of iron oxides. 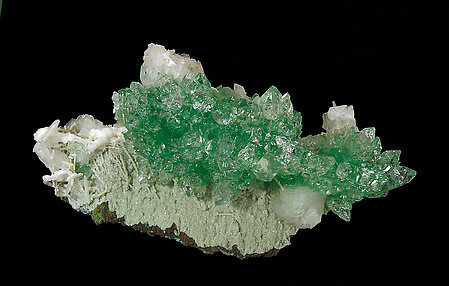 A small group of Fluorapophyllite-(K) crystals, one of them clearly dominant, translucent, with a deep green color and on a matrix of slightly pinkish Stilbite-Ca and also with prismatic acicular Scolecite crystals that are clear and colorless. 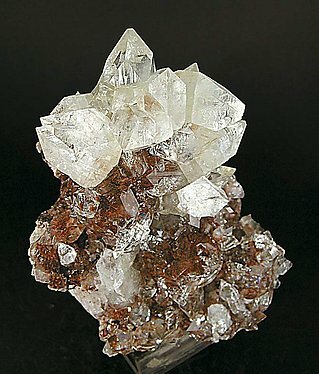 One of the most beautiful specimens from the Jan Buma zeolite collection. The thin matrix supports a large group of Fluorapophyllite-(K) that has good color, is very transparent and stands well clear of the matrix. There are also some nice sprays of Stilbite. A real beauty. We will send the buyer Jan’s label. A novelty in Munich 2009. 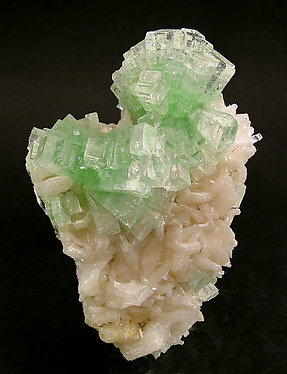 Clear green crystals, very transparent and bright, with the prism more elongated than usual and with groups of white crystals of Stilbite and on matrix. From a locality near Pune District not well known until recently. Very sharp Fluorapophyllite-(K) crystals with a very acute terminal pyramid. 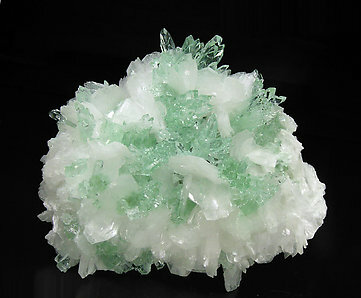 Crystals are very bright and color is very intense, it contrasts with the white color of the Stilbite matrix. Elegance and beauty combine in this sample that Jan Buma got in Jalgaon. 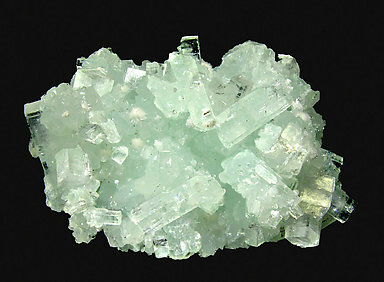 Luminous, clean, with crystals that appear to be very well defined, given the contrast between the green and the white. 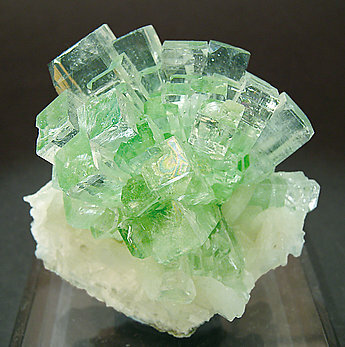 Doubly terminated crystals, green and transparent, that combine the faces of a very short prism with the dipyramid and the pinacoid, and, so, they take cubic shape. The matrix is also rich in groups of bow-tie shaped Stilbite. 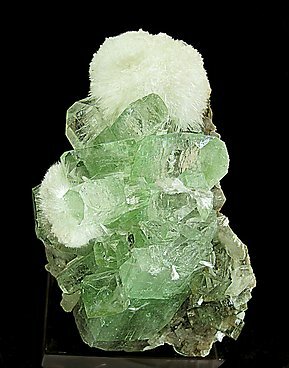 The quality of this one cannot be denied, but one must note the aerial position of the group of sharp Fluorapophyllite-(K) crystals and the green zoning of their interiors. They are on a matrix that is coated by Stilbite crystals. 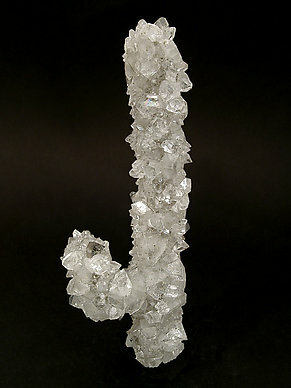 A spray of crystals, well placed on the matrix of Stilbite. A very visual specimen. 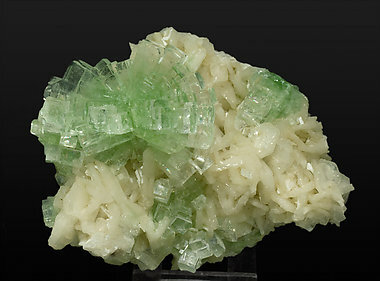 Typical radial aggregate of this find, with crystals formed by the prism and the pinacoid, very bright and with a diffuse color zoning, green at the base and colorless on the termination, with white bow-tie crystals of Stilbite, and on basalt matrix. 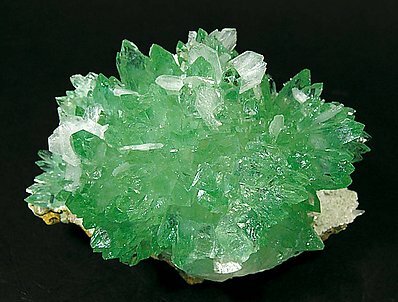 Esthetic radial group of prismatic crystals, clear on their external part and with visible green phantom growths in them. 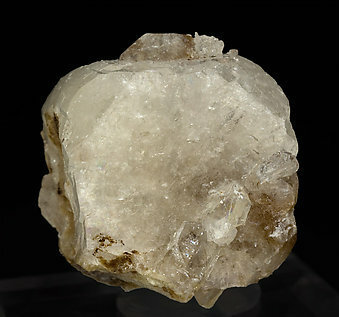 The group is centered on a matrix of white, slightly yellowish, crystals of Stilbite. I find it hard to imagine how something like this formed. 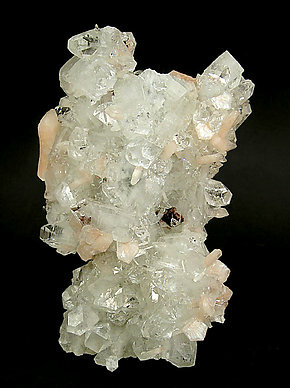 The center, possibly of a Quartz stalactite, has been completely covered by Fluorapophyllite-(K) crystals of various sizes. A small brown Stilbite adds to the specimen. Undoubtedly the most prominent aspect of the piece is its color. 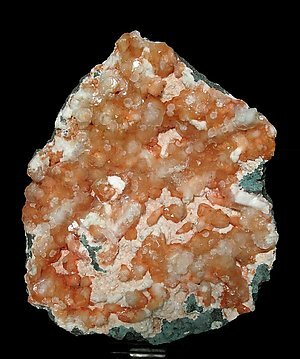 An intense and unusual orange color, affecting both the Fluorapophyllite-(K) and the Stilbite and contrasting with the matrix, dark in some places, white or pink in other. A very attractive ensemble. 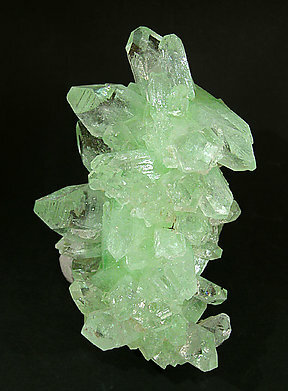 Most of the crystals of Fluorapophyllite-(K) are doubly terminated, formed from a prism and very sharp pyramids. 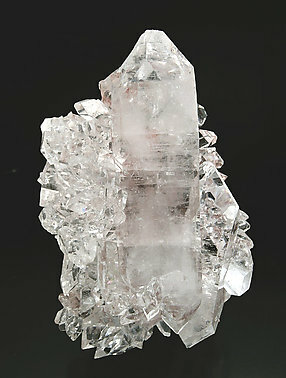 The brilliance and transparency are very intense and the crystals of pink Stilbite seem to soften the esthetics, giving balance to the specimen.